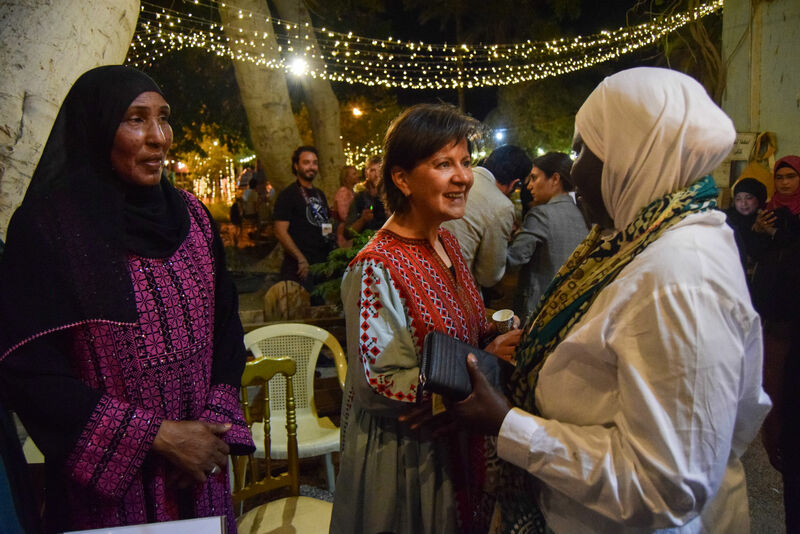 Rural women in Jordan’s villages often lack the skills needed to develop their businesses, and turn the resources available around them into high value products with market demand. H.E. Minister of Tourism and Antiquities Ms. Lina Annab meets the Ghor Safi home-based businesses at Al-Numera Environmental Association; part of the AdventureNext Conference 2018. USAID LENS has launched a nation-wide initiative targeting woman-owned home-based businesses that specialize in food-processing, to help them grow and develop into formal businesses that are able to create market linkages and increase their revenues. When coupled with the cultural barriers women in rural areas generally face while looking for a job, the lack of business resources available to them impacts on the family’s living status, income, and the women’s overall confidence. “For the majority of women in Jordan, working from home is still the most accessible work opportunity available around them, and this calls for a need to develop their business and technical skills” said Dalal Obeid, trainer and consultant from Al-Etizan, a consulting firm based in Amman, Jordan. With that understanding in mind, she applied for a grant from the USAID Jordan Local Enterprise Support Project (LENS) in 2016, which targeted consultants and trainers to launch a Home-Based Business Upgrade training program in different regions of Jordan where home-based businesses needed support. The training program developed by Al-Etizan targeted 44 women from two main villages in Jordan’s Ghor Safi: Ghor Haditha and Ghor Fifa. Ghor Safi is known for its fertile soil and agriculture, and the majority of its population works in farming and selling produce. Some of Jordan’s best tomatoes are grown in the Ghor Safi area, which are exported immediately to other countries, leaving a surplus of grade A tomatoes that generally go to waste. Dalal saw a business opportunity in that, and given that most women are either daughters of farmers or are married to one, her vision was in place. 10 kg of fresh tomatoes cost around 30 piasters (US$ 0.42), so a family in Ghor Safi is not able to make much of an income from the surplus tomatoes left if sold. This same quantity can be used to produce sun-dried tomatoes, which are sold for 3 JD (US$ 4.23) per kilo. This significantly increases revenues for the women who are producing food and selling it. After doing some research and realizing that sun-dried tomato consumption is low in Jordan, the women of Ghor Safi, with support from USAID LENS, created two innovative sun-dried tomato-based products: pesto and powdered sun-dried tomato, offering buyers a fresh, higher quality product than anything else in the market. As a result of the training program in Ghor Safi, 49 of the businesses have increased their revenues, creating 31 jobs and forming 26 business linkages with other entities so far. Al Etizan is currently working on linking the women with local restaurants, and is about to export samples of the pesto to France. Some of the home-based businesses at the launch of the of home-based businesses regulations evernt organized by USAID LENS.